In 1924, when Lenin died, the Communist Party leadership decided not to bury its leader, but embalm his body and put it on public display. The USSR ceased to exist 25 years ago, but the body of its founder Vladimir Lenin continues to lie in a mausoleum on Red Square beside the Kremlin walls. Find out here why the tomb was built, why Lenin has still not been given a normal burial, and how much the state pays to preserve him. 1. 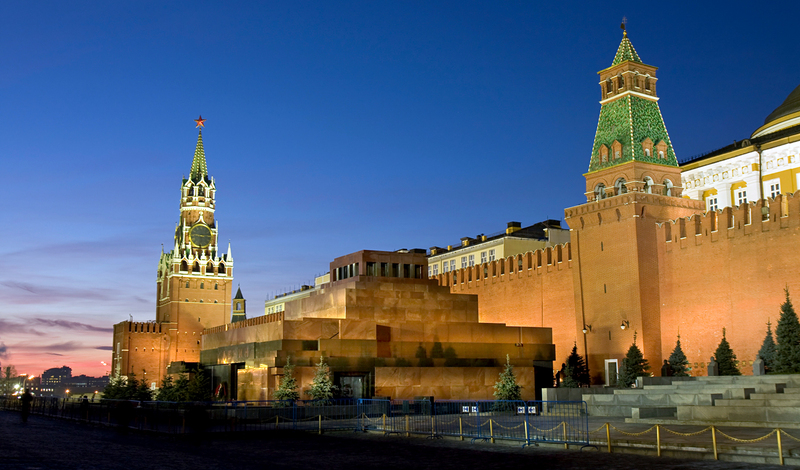 There’s a strange dark red pyramid near the Kremlin wall on Red Square. What is it? This is the Mausoleum, the memorial tomb of Bolshevik leader Vladimir Lenin. Lenin led the October Revolution in 1917, governed Soviet Russia during the Civil War and was one of the founders of the USSR. In 1924, when Lenin died, the Communist Party leadership decided not to bury its leader, but embalm his body and put it on public display, despite the fact that Lenin himself had expressed a wish to be buried alongside his mother in Petrograd (now St. Petersburg). The building of the mausoleum was designed by the renowned architect Alexei Shchusev, the man responsible for Russia's pavilion in the Giardini park in Venice. It was opened to the public in 1930. It is interesting that the top tier has a stand, from which Soviet leaders right up to Mikhail Gorbachev welcomed the parades in Red Square. 2. Why did the Bolsheviks embalm Lenin? The man responsible for the decision to embalm Lenin was his eventual successor, Joseph Stalin. In November 1923, when Lenin was still alive but terminally ill, Stalin suggested that the dead body should be "preserved using embalming" to give the opportunity for everyone to say goodbye.Part of the Bolshevik leadership met the idea with indignation. Leon Trotsky, who was considered to be the second most important figure in the party after Lenin, compared the preservation of the body to the creation of "holy relics" worshiped by Christians – an unheard-of thing for ideological communists. His widow, Nadezhda Krupskaya, also reacted very negatively to the preservation of the Bolshevik leader's body. 3. Why was this necessary? Lenin played an important role in the political system of the USSR. His commandments were followed by all the Soviet leaders, and he turned into a sacred figure, kind of a Communist saint. "Stylized portraits and busts of Lenin were its icons, his idealized biography its gospel, and Leninism its writings," Harvard University professor Nina Tumarkin wrote in her book Lenin Lives! The Lenin Cult in Soviet Russia. People dedicated songs and poems to him, and monuments to him adorned every single city in the Soviet Union. The mausoleum also became a symbol of loyalty to the ideals of Leninism. A visit to this place in Moscow was a kind of pilgrimage – for both Soviet citizens and delegations from friendly countries. The tomb was visited by up to 2.5 million people annually. 4. Lenin died more than 90 years ago. How has the body been preserved? When Lenin's body was dissected and prepared for the exposition, his internal organs were removed and fluids in the body were replaced by a special embalming solution, which slowed down the process of decomposition. Scientists still keep the body in good condition, injecting preservatives and immersing the body in a bath of preservative solution every year and a half. Now no more than 23 percent of the body is still there, however, it retains its physical appearance, skin elasticity and flexibility of joints. But the suits in which Lenin lies deteriorate and have to be changed. 5. The USSR no longer exists, and communists are not in power anymore in Russia. Why is Lenin still lying in the mausoleum? This is the subject of constant arguments. Some Russians, especially those critical of the Soviet past, are outraged by the fact that there is a "mummy" in the middle of Red Square and demand for the body to be buried. This idea, for example, is supported by a number of human rights advocates and members of the clergy. But there are those who are not ready to bury the famous Bolshevik – first of all, the communists. According to them, Lenin is already buried (the sarcophagus with the body is at a depth of three meters below ground), while the mausoleum is a unique historic monument, which cannot be deprived of its substance by removing the body. The government is neutral. Russian President Vladimir Putin, commenting on the possibility of burial, said that this issue should be approached carefully, so as "not to divide society." According to the most recent opinion poll, a majority of Russians (60 percent) are generally supportive of the idea of burial. 6. How much does the maintenance of the mausoleum cost? According to information on the State Procurement Agency website, 13 million rubles ($199.754) was allocated for "biomedical work to preserve Lenin's vital appearance" in the 2016 budget. 7. How can you visit the mausoleum? What can you see inside? To visit the tomb, you have to get up early: The mausoleum is open from 10:00 to 13:00 on Tuesdays, Wednesdays, Thursdays and Saturdays. Attendance is free, but you may be charged some money for the use of storage (taking cameras and mobile phones inside is not allowed).The visit takes place according to strict regulations. The sarcophagus with the body sits on a plinth, and it is forbidden to get close to it or stay for a long time. Under the watchful eye of armed guards, you should walk around the sarcophagus in a semicircle, observing the ever-still revolutionary, before exiting to the Kremlin Wall Necropolis. Here lies the cream of Soviet society: from Stalin to Brezhnev to cosmonaut Yuri Gagarin. Nobody will hurry you along at the necropolis. You may lay flowers at someone's grave – or just wander, thinking about the transience of human life.